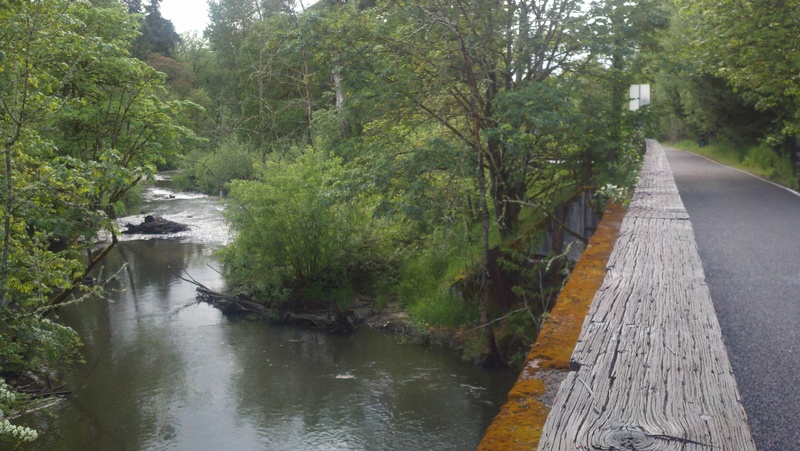 The Springwater Corridor is a long paved trail that begins on Portland’s inner east side and soon heads east, winding through the Johnson Creek watershed and out to Gresham, and eventually the small town of Boring. It’s hard to believe you are near a major city for much of the way considering the greenery and quiet. Cyclists love it, but it’s great for joggers and walkers too. I hadn’t set foot on the trail in years, but now I live nearby, so it was natural choice for a quick stroll. So it was that a few days ago, I ventured to a trail access point with Jackie Chan, the hiking pup. I soon discovered an offshoot nature trail along Johnson Creek, and twenty minutes later, I ended up mid-span on a bridge over the railroad tracks. I had no desire to cross over them and head into the neighborhoods beyond, so I just retraced my steps through the greenspace. The rain started pelting us on the way back. Jackie didn’t care for it, so we walked fast, and it was all good.